In honor of Earth Day 2016 Curb'd celebrates all things green by sharing the inspirational story of NYC's Lowline. This project involves the transformation of a historical trolley terminal beneath the city's Lower East Side into a lush underground park. By harnessing solar energy from the streets above Dan Barasch, co-founder and director of the Lowline, intends to create a verdant 4-season destination for the public. Much like the Curb'd process, the Lowline seeks to unite both designers and builders together in order to create beautiful work and reclaim forgotten public spaces. The former Williamsburg Bridge Trolley Terminal was in operation from 1908 until 1948 when it was finally abandoned. The neighborhood above is notorious for being overcrowded and contains even less green space per resident than the urban core. The unused, subterranean space is roughly the size of a football field and can remain at a comfortable temperature year-round. But the questions remains, how do you turn this unique space into a desirable place to be? The answer lies in an innovative design that could potentially transfer and reflect enough wholesome sunlight below ground allowing plants to grow. In October 2015, the Lowline Lab opened in order to demonstrate and test the effectiveness of this new technology. The Lowline Lab is a long-term experiment, part laboratory and part exhibit, showcasing the possibilities of sustainable plant-life underground. The lab is only a few blocks away from the proposed site on the Lower East Side and attempts to mimic the conditions of the trolley tunnel accurately. The lab has become a popular attraction for curious minds and creative-types interested in cutting edge solar technology and serves as a "proof of concept" for the proposed project. 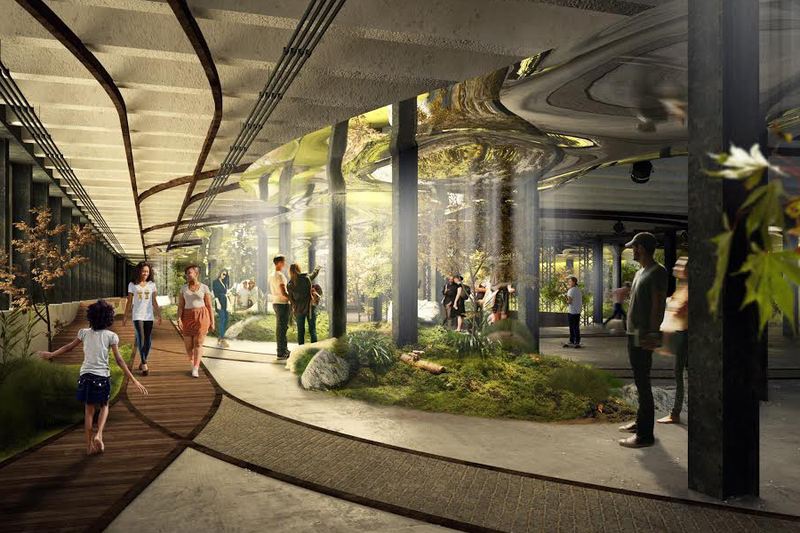 Below are a series of artist renderings of what a completed Lowline might actually look like. To learn more about this innovative project check out the Lowline homepage or watch Dan's exciting TEDtalk.